Four young people are trying to understand why their friend, a young woman, committed a suicide. A film made up of disconnected scenes weaving between past and present. 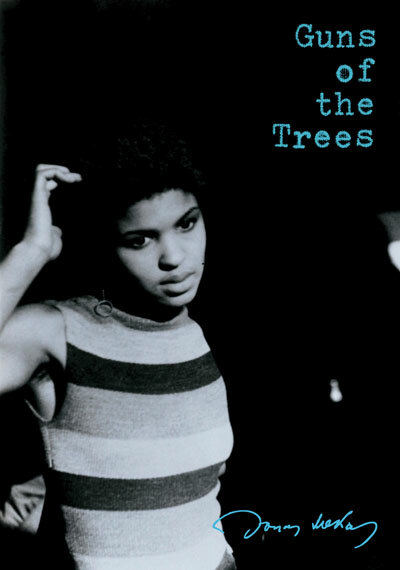 The title of the film comes from a poem by Stuart Perkoff which tells that some young people felt (around 1960) that everything is against them, so much that even the trees in the parks and streets seemed to them like guns pointing at their very existence.' - J. M. 'Guns of the Trees deals with the thoughts, feelings, and anguished strivings of my generation, faced with the moral perplexity of our times. Conceived as an episodic, horizontal film, there is no apparent direct story connection between one scene and the next. The scenes act like pieces of a larger, timed, emotional mosaic. Where the direct word, or the direct image, fails - when we come to more essential things - the indirectness of the poet will seize the essence and the truth.' - J. M. 'It is a bitter but lyric work. It is also revolutionary in form, being unlike, in its technique, anything you ever saw. It is a poster declaration, a manifesto. I regard Guns of The Trees as the most important film by far of the American 'New Wave.' - Herman G. Weinberg, New York Film-Makers' Cooperative Catalogue n°6, 1975 'It may be one of the most personal and revealing films of the intellectual, beat and hip fringe of society of America today.' - Gene Moskowitz, Cahiers du cinema, N°119, May 1961 All rights of the producer and of the owner of the work are reserved. Unless authorized by the rights holder, no duplication, hiring, lending or public screenings are allowed. For institutional purchase please contact Re:Voir directly. Four young people are trying to understand why their friend, a young woman, committed a suicide. A film made up of disconnected scenes weaving between past and present. The title of the film comes from a poem by Stuart Perkoff which tells that some young people felt (around 1960) that everything is against them, so much that even the trees in the parks and streets seemed to them like guns pointing at their very existence.' - J. M. 'Guns of the Trees deals with the thoughts, feelings, and anguished strivings of my generation, faced with the moral perplexity of our times. Conceived as an episodic, horizontal film, there is no apparent direct story connection between one scene and the next. The scenes act like pieces of a larger, timed, emotional mosaic. Where the direct word, or the direct image, fails - when we come to more essential things - the indirectness of the poet will seize the essence and the truth.' - J. M. 'It is a bitter but lyric work. It is also revolutionary in form, being unlike, in its technique, anything you ever saw. It is a poster declaration, a manifesto. I regard Guns of The Trees as the most important film by far of the American 'New Wave.' - Herman G. Weinberg, New York Film-Makers' Cooperative Catalogue n°6, 1975 'It may be one of the most personal and revealing films of the intellectual, beat and hip fringe of society of America today.' - Gene Moskowitz, Cahiers du cinema, N°119, May 1961 All rights of the producer and of the owner of the work are reserved. Unless authorized by the rights holder, no duplication, hiring, lending or public screenings are allowed. For institutional purchase please contact Re:Voir directly.